tamaquastation@gmail.com to volunteer your time or to donate. Meetings are held the fourth Monday of the month @ 6:00 at the Station. Tamaqua Station Restaurant, Hours! Wednesday through Saturday 11:00 a.m.- 9:00 p.m.
Sunday 10:00 a.m.- 8:00 p.m. Closed Mondays & Tuesdays. The Station Creamery opening March 28, 2019. Spring hours : Closed Monday & Tuesday, Wednesday through Sunday 3:00 p.m. - 9:00 p.m.
Next Stop, the Tamaqua Railroad Station! Take a step into the past as you enter Tamaqua’s restored 1874 Philadelphia & Reading Railroad. 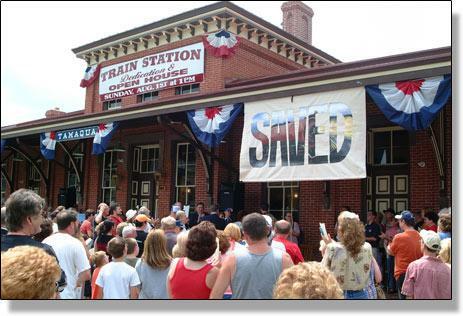 Saved from the brink of demolition, the Tamaqua Railroad Station now serves as a heritage center, as well as a cultural and economic hub in Historic Tamaqua. Be sure to make a stop at the Tamaqua Railroad Station on your next visit! There is plenty of parking in the lot on Route 309 South. After parking, cross the tracks safely at the pedestrian crosswalk. A handicap accessible entrance is located at the rear of the Station. Click to download “Save Our Station” song to hear an original jingle written by Tamaqua’s Bill Hughes to aid the restoration efforts. Give your loved ones a gift they will never forget. Our souvenir shop features engraved bricks for the Memorial Sidewalk, hats, tees and many other items. Station Creamery now open in the Railway Express Room at the North End of the Station! Preservation of our Railroad Station is no easy task; so please lend a hand, get involved and help our organization maintain the station for future generations to enjoy. Find visitor information for your next trip. Schuylkill County features three State Parks, seven campgrounds, the Appalachian Trail, the little Schuylkill River, Sweet Arrow Lake Park, America's Oldest Brewery, tours of an actual anthracite coal mine, and more. Copyright Tamaqua SOS. All rights reserved.